Thyroid eye disease (TED) is the most common cause of unilateral or bilateral proptosis in adults. It occurs most commonly in patients who are hyperthyroid. However, it may also occur in patients who are hypothyroid or even euthyroid. The characteristic finding on CT scan is enlargement (due to inflammation and fibrosis) of the extraocular muscle bellies. The muscle tendon is typically spared. The muscles most commonly enlarged in TED are the inferior rectus followed by the medial rectus, although any of the muscles may be involved. It can contribute to vision loss by causing a compressive optic neuropathy. 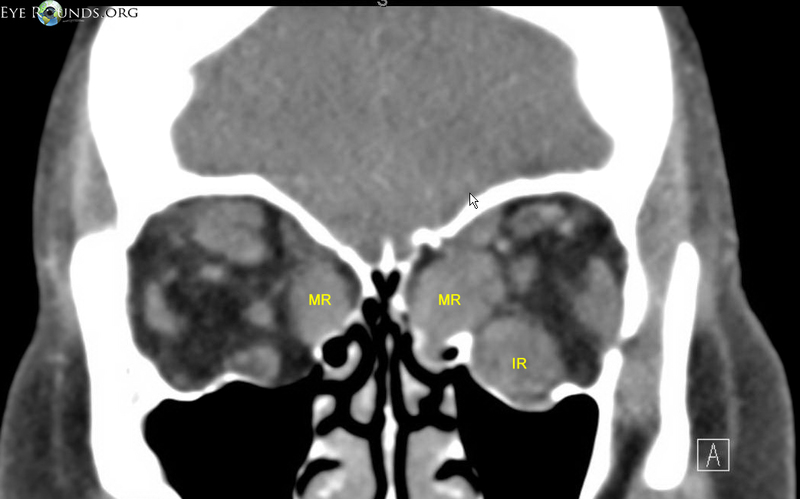 This patient is a 60-year-old female who has severe TED and has already has undergone bilateral orbital decompression (please note that the orbital floor and lateral orbital wall show areas of bony discontinuity). Figure 1. Axial CT scan showing enlarged muscle belly in Thyroid Eye Disease. 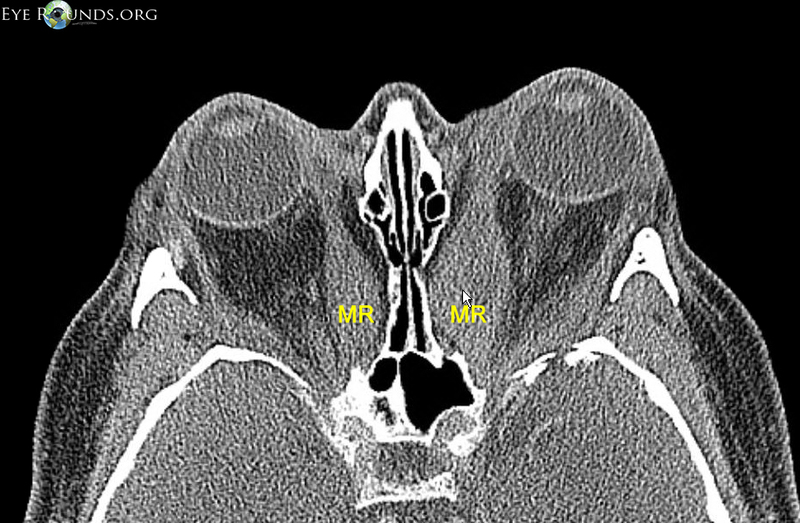 The medial rectus muscle is marked "MR"
Figure 2. Coronal CT scan showing the enlarged muscle bellies in cross section. The medial rectus muscle is marked "MR" and the inferior rectus is labled "IR"